The secret of Prime Minister Tony Blair famous all-year healthy glow has been revealed -- his spends almost twice as much on make-up as the average British woman. Figures released by Downing Street in answer to a parliamentary question showed that Blair spent more than 1,800 pounds (2,600 euros 3,100 dollars) of taxpayers' money on make-up and make-up artists over the past six years. In contrast, the average British woman spends 195 pounds a year on both make-up and skincare . The written answer -- released quietly on Thursday, the final day of the parliamentary session before MPs begin their summer break -- said that between 1999-2005, Downing Street paid out 1,050.22 pounds in cosmetics for the prime minister's media appearances. In the past two years, a further 791.20 pounds was spent on make-up artists. 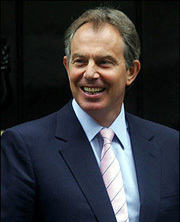 In the run-up to the May general election, many pundits noted that Blair had acquired a suspiciously orange glow. The prime minister insisted he had merely picked up a tan while sitting in his garden during the month of April.